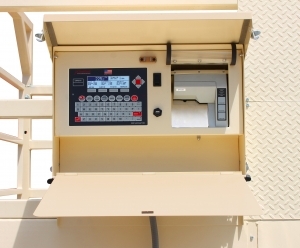 Cardinal Scale’s mobile Weight Wrangler group animal scales provide a self-contained NTEP legal-for-trade weighing system that can be used on any firm surface with up to a 5% grade. The livestock scales include an integral air pump to easily lift and lower the trailer’s air bag suspension. Models come in 18-ft-long tandem axle or 13-ft-long single axle. The rubberized component deck and steel cattle pen enclosure with dual gates are all suspended at four points within a mobile base frame. 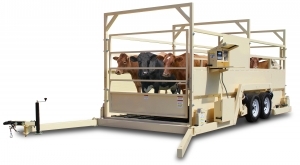 The Weight Wrangler can weigh groups of cattle up to 15-20 head at a time (20,000 lb capacity). The scale includes weight indicator, ticket printer, and battery. Structural steel levers and seamless steel tubing provide extra strength and less weight. Fewer levers and double-link suspension bearings mean less wear and tear and eliminates platform shock prolonging the life of this scale. Pivots are tempered high-grade tool steel and, along with self-aligning bearings, are supported throughout their entire length. 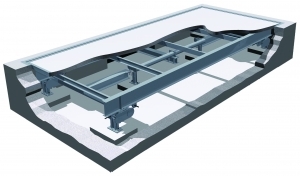 Interchangeable parts and simple pit design make installation and maintenance simple. Many different platform sizes and weight capacities are available to choose from, ranging from 12 x 8-foot to 26 x 14-foot and 5 to 20-ton respectively. These farm scales provide an economical approach to agricultural weighing. Available in wood or concrete deck models. Livestock rack not included. NTEP legal-for-trade.